Discover the best things to do in Brisbane. Hop on the free CityHopper Brisbane ferry to South Bank and spend the day at some of the country’s best museums. Start at QAGOMA (Queensland Art Gallery and Gallery of Modern Art). Located in the Cultural Precinct, QAGOMA features over 17,000 works of art, has renowned exhibitions and is home to the Children’s Art Centre and Australian Cinémathèque. Then, head next door to the Queensland Museum to brush-up on natural history, culture and people of Queensland. Fancy dinner and a show? South Bank has you covered here, too! 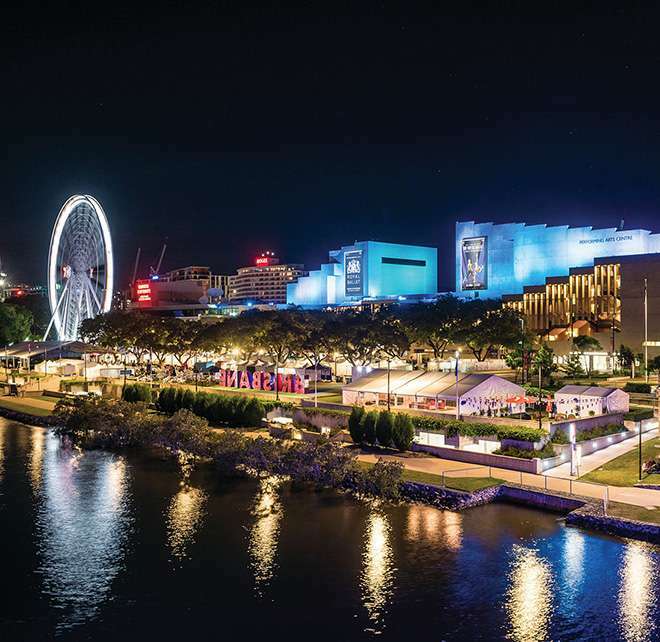 Choose from almost any cuisine at the plethora of restaurants and cafes scattered along South Bank followed by a Broadway musical, ballet, opera or comedy show at QPAC (Queensland Performing Arts Centre). Located on the Brisbane River in New Farm, Brisbane Powerhouse holds some of Australia’s largest events, such as the Brisbane Comedy Festival, as well as photography exhibitions, comedy shows and free experiences for kids. It’s also a great place to grab a bite to eat or afternoon drink, or some fresh produce at the Jan Powers Farmers Markets each Saturday. Sports more your thing? Catch a Brisbane Roar or Socceroos game at Suncorp Stadium or some cricket at the Gabba. Brisbane Entertainment Centre hosts all kinds of musical acts, from Shania Twain to Mumford and Sons, so make sure you check it out if you want to groove along to your favourite tunes. Wherever you find yourself in Brisbane, there’s sure to be a restaurant or dining precinct around the corner. From lively Chinatown and eclectic pubs in Fortitude Valley, to waterfront dining on Eagle Street Pier, there’s something to suit every taste. In the charming suburb of Spring Hill, you’ll find award-winning restaurants, coffee shops and historic pubs. Be sure to check out Tumbling Stone Restaurant & Bar for a delicious dinner –the popcorn panna cotta is a crowd-pleaser! Book your Brisbane accommodation at The Johnson, ideally located in Spring Hill. Picnic at Hanging Rock has haunted the Australian psyche for over a century. One summer’s day in 1900, three schoolgirls and a teacher inexplicably vanished, never to be seen again. Now showing at Malthouse Theatre, supported by Art Series Hotel Group, director Matthew Lutton discusses how the play resonates with Australian audiences and what to expect from the production.